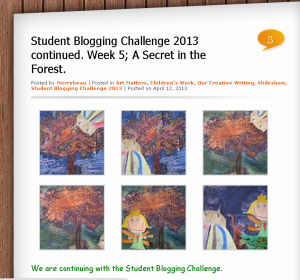 of the Student Blogging Challenge 2013.
about blogging in that time. and to ask someone else to audit it. or set by the challenge? and the other 111 were school related. from classmates, teachers or overseas students? 6 were from students from other schools in Ireland. Which post received the most comments? were asked to comment as part of that week’s challenge. those bloggers got in contact. It is very hard to choose which post we enjoyed writing the best. No our blog theme is like our identity at this stage. Our parents and friends who visit would recognize it. We don’t recognize this place. and we wouldn’t like that. So we would be slow to change it. How many widgets do you have? We LOVE widgets. We have 20 widgets. Do you think this is too many or not enough? we are going to leave them there. and add to the personality of our blog. 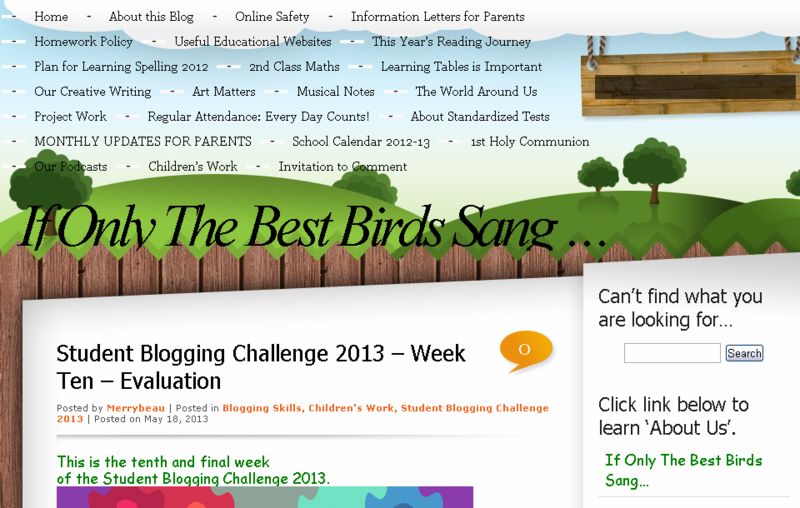 and 12 overseas class blogs on our links. and I liked all the images. What suggestions can you give us to improve the blog? This entry was posted in Blogging Skills, Children's Work, Student Blogging Challenge 2013 and tagged Blogging Skills, Children's Work, Student Blogging Challenge 2013. Bookmark the permalink.